Allison has been training with Coach Amanda since she was 3 months pregnant with her first baby and Brian joined her not too long after. Their daughter, Poppy, who is now 18 months, comes to all their sessions with them and is a total trooper. 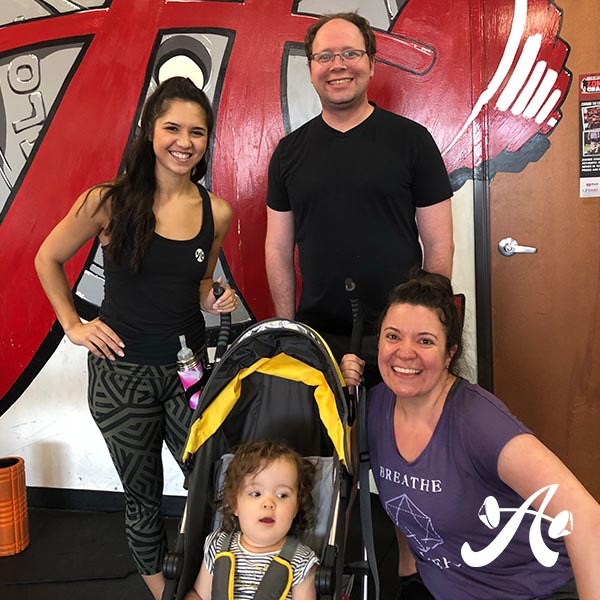 In the last few months, this fitness-focused family has directed their efforts back to the basics for powerlifting movements and are now seeing the benefits of perfecting fundamentals by hitting PRs almost every time they go for them, especially in squats. Their energy and excitement to get stronger is sweet to watch and we know that their daughter is learning how to live a healthy and active life through their example. I was newly pregnant & looking to switch from boot camp style workouts to strength training. I was originally paired up with another gym partner who soon after moved away & Brian decided to join in the fun/partner up shortly there after! To stay fit during pregnancy & consistently train! We worked out consistently from about week 16 of my pregnancy up until a few days before I delivered! Post baby, Brian started back up a few weeks after our daughter was born & I rejoined him as soon as I got the release from my doctor, about 6 weeks postpartum. What changes have you noticed in your body, mind, spirit since starting at ASF?/What is it about Amanda/ASF that keeps you coming back? Why do you like working out with Amanda? Amanda is tough, but so incredibly affable – we look forward to each session (as does Poppy!) Even though we may giggle occasionally (& have an adorably entertaining & sometimes distracting toddler in tow) Amanda keeps us in line, working hard & we feel the burn for days after!